NEWPORT, RI --- From Aug. 15-16, the Advanced Naval Technology Exercise (ANTX) 2017 Battlespace Preparation in a Contested Environment (BPCE) took place at both the Naval Undersea Warfare Center Division Newport and the Naval Surface Warfare Center Panama City Division, partnering with fleet operators from Submarine Development Squadron Five from Keyport, Washington, and the Explosive Ordnance Disposal Mobile Unit One in Panama City, Fla. 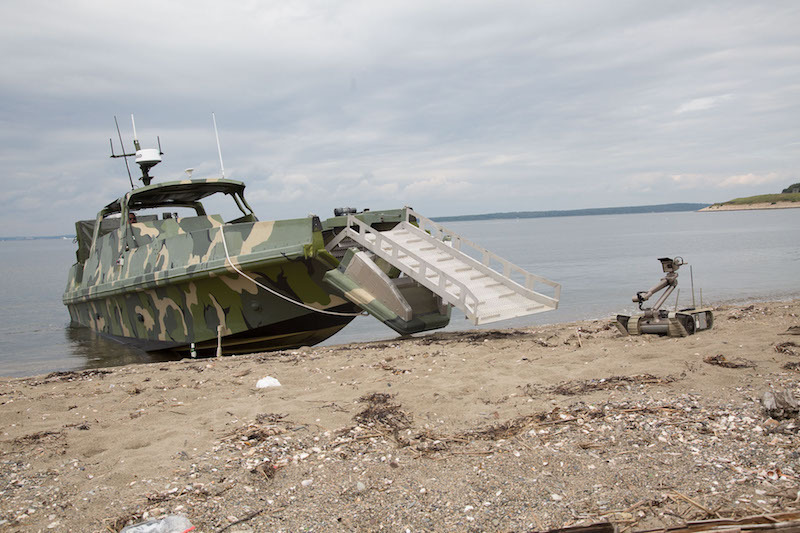 The multi-site event featured live exercises of tasks above and below the water including bordering shorelines and welcomed more than 700 attendees who observed 50 unmanned systems in action — 11 unmanned aerial vehicles (UAVs), 9 unmanned surface vehicles (USVs), 28 unmanned underwater vehicles (UUVs), and two unmanned ground vehicles (UGVs). NUWC Newport exercises focused on Intelligence, Surveillance, and Reconnaissance (ISR), while NSWC Panama City exercises focused on Mine Warfare (MIW) and Mine Countermeasures (MCM). ANTX BPCE met its critical goal of the undetected collection, fusion, and transmission of data, exercising technology enablers that facilitate autonomous operations, and the successful coordination among autonomous platforms and their operators. The event also provided an opportunity for pier-side collaboration among technology developers from industry, academia, and warfare centers, and Navy operators and program offices. This collaboration created the high-velocity learning environment critical to supporting rapid prototyping of innovative, emerging technologies. The target audience for ANTX is Fleet operators who will one day use these systems, Navy decision-makers who direct acquisition funding, as well as the Navy’s industry and academic partners interested in forming the future partnerships that will speed the research, development, test, and evaluation timeline. "I look to the scientists and engineers, alongside the uniformed warfighters, to combine their expertise and insight in technology and operating concepts to help us continue to be able to fight and win going forward," said Adm. Phil Davidson, Commander, U.S. Fleet Forces during his kick-off remarks via video teleconference. Maj. Gen. David Coffman, OPNAV N95 from the Pentagon, served as the keynote speaker and told reporters that NAVSEA Warfare Centers are vital to the transition of technical capabilities from the labs to the fleet. "I think the really brilliant people that we have working here at the center and all of our Warfare Centers are key to that," said Coffman. Rapid prototyping, or accelerating the process that gets new technology into the hands of the warfighters, is a big component of ANTX and was on full display as research engineers and chemists from NUWC Newport’s Energy and Propulsion Branch partnered with Riptide Autonomous Solutions to successfully test a proton exchange membrane (PEM) fuel cell-powered micro UUV. Their collaboration began at ANTX 2016 when NUWC researchers showcased their work in the areas of lithium batteries, solid oxide fuel cells, and metal hydrides. When not manning the booth, research engineer and Navy diver Christian Schumacher worked with NUWC Newport’s Engineering and Diving Support Unit to support Massachusetts-based Riptide Autonomous Solutions, who was testing their micro-UUV. As a result of the year-long collaboration, ANTX 2017 featured the integration of Riptide’s commercially available vehicle and NUWC Newport’s PEM fuel cell. The team had previously estimated they were about five years away from testing a PEM fuel cell-powered vehicle in the water but the meeting at ANTX 2016 allowed for rapid prototyping to occur. NSWC Panama City had six different demonstrations including “Single Sortie Detect to Engage Unmanned Surface Vessel-based Mine Neutralization,” which deployed a tetherless mine neutralization UUV surrogate deployed from an 11-meter rigid hull inflatable boat. As part of the Smart Mining Initiative, a rapid prototyping team demonstrated a suite of modern sensors, UAVs, UUVs, and communications equipment that provided command and control and data exfiltration to the ANTX Command Center. “Multimode SAS System for Underwater Mapping and Mine Countermeasures” used the latest generation small synthetic aperture minehunter/REMUS AUV to demonstrate the effectiveness and flexibility of wide-beam, multi-frequency, multi-mode imaging synthetic aperture sonar. “Buried Object Localization Using a Supervised Autonomous Platform” demonstrated autonomous behaviors on the Dive Buddy Remotely Operated Vehicle using a forward-looking sonar for obstacle avoidance, situational awareness, and to evaluate any surface expression of the buried targets. “Advanced Autonomy for Mine Countermeasure Operations” demonstrated multiple UUVs collaborating to complete mine countermeasure missions. “Expeditionary Mine Countermeasure Data Analysis” tested new concepts to improve automated target recognition performance by exploiting human-in-the-loop tuning software and decreasing MCM prosecution timelines. What happens in the months following the event is just as crucial as the exercises during the event. Data collected will be aggregated and evaluated and collaboration needs to be fostered through the next ANTX and beyond. Following ANTX, the Southeastern New England Defense Industry Alliance (SENEDIA) hosted its Defense Industry Days in Newport on Aug. 28-30. Many of the keynote speakers spoke about rapid prototyping and pointed to NUWC Newport and ANTX, specifically, as a venue for the rapid development of technologies and getting new state-of-the-art products and systems to the warfighter in a shortened timeframe. Vice Adm. Michael Gilday, commander, U.S. Fleet Cyber Command, U.S. 10th Fleet, encouraged the audience to not be so driven by military requirements and to rely less on market analysis and more on innovative technology. In his second day at his new position, William Bray, Deputy Assistant Secretary of the Navy for Research, Development, Test and Evaluation, addressed the audience and highlighted the importance of innovation, assembling the right teams, and the need for a faster cycle to get technology to Sailors. Bray emphasized the need to “use autonomy in unmanned systems to be a force multiplier,” a concept exercised throughout ANTX.